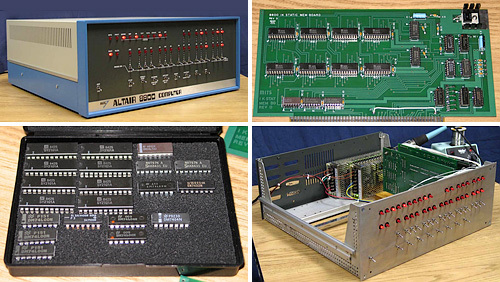 Altair 8800 Kit | OhGizmo! I’m probably far more versed in the history of the personal computer than someone really should be but in high school I was quite fascinated by the whole saga and read a lot of books on the subject. One device that got a lot of mentions was the MITS Altair 8800 which is considered to be the system that truly sparked the personal computer revolution. Among certain collectors the MITS Altair 8800 is considered to be one of the most prized computers you can own. In fact the first working sample was sent to Popular Electronics’ offices in New York to be photographed but never arrived and has never been seen since. Somewhere, somebody is in possession of a priceless piece of hardware and doesn’t even realize it. If you’re thinking this might be a great Christmas gift for someone then you better get your wallet out since there are a limited number of kits available before the big day arrives and they’re exclusively being sold on eBay at the moment. It looks like the last auction closed at $1,725 but there are two more sitting at bids of $1,700 and $400. All very cool, but does it do anything?